Planning a business or commercial development is a challenging task with many competing factors to consider. One aspect of significance is the environmental surroundings. Increasing public awareness of creative aesthetics, environmental sustainability and a desire for more access to public green spaces are driving the push for installing lawns. When designing open areas for public or commercial developments, interest is growing in the importance of open lawns. There are many benefits to incorporating lawn into your plans, both tangible and intangible. The good news for challenging open spaces is that hardy lawn varieties are available that will survive in shady areas, with low-maintenance. Aside from being aesthetically pleasing, a commercial green space is an environmentally sustainable asset and a low-cost, more welcome alternative than using hard surfaces in landscape design. What Are The Advantages Of Adding Commercial Green Spaces? As well as environmental benefits such as carbon absorption, oxygen production and a decrease in dust and air pollution, there are a number of other reasons green spaces enhance commercial premises. A well-maintained lawn improves the visual appeal of your business premises or public area, as well as increasing the value of your property. It will provide a natural cooling affect through heat dissipation, reduce storm water runoff and acts as a natural fire barrier for surrounding buildings. Open green space has a marked positive effect on the workforce: a whopping 77 per cent of employees within Australia think access to a lawn at the workplace helps reduce their stress and anxiety, and nearly half surveyed said green space improves their concentration and productivity levels (Turf Australia, Summer 2013/2014). 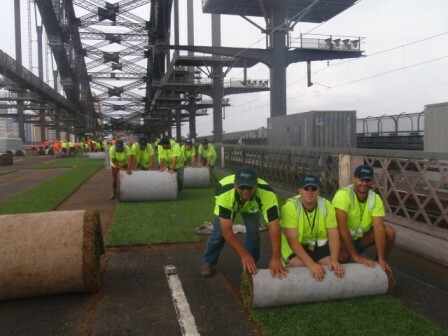 The key aspects to consider when planning a commercial turf installation are – selecting a suitable grass variety for the conditions, accurately measuring the site, meeting safety requirements for installation, ground and soil preparation, reticulation systems and having a plan for ongoing maintenance. A reputable turf supply company can help organise each of these and the many other details for a professional landscaping result that protects your investment. To maximise the benefits, look for an experienced supplier with a good reputation for commercial turf production and installation, appropriate licensing and insurance cover. A detailed WHS management system to ensure all safety requirements are adhered to is also important for the installation process. Your regular lawn maintenance can be managed in-house or contracted out to a reputable commercial gardening company. Hi Quality Turf will be more than happy to provide free after-sales support if there is a shortage of internal resources at your business to manage your essential ongoing lawn-care. Hi Quality Turf is a member of the Turf Producers Association and Turf Growers of NSW and satisfies all regulatory and safety needs for small and large scale landscaping projects. Certificates of Authenticity for turf varieties are provided, as well as assurances all turf is free of pests, diseases and cross-contamination. We pride ourselves on our superior customer service and in many cases can have a substantial amount of turf laid within 24 hours of being contacted for a commercial installation. Our dedicated landscaping professionals and use of efficient specialist equipment means you’ll get a superior result with a minimum of inconvenience, every time. Hi Quality Turf is a family-owned business that has been providing professional service and specialised advice in both residential and commercial turf supply and maintenance for 35 years. With obligation-free quotes, preparation and installation services and free follow up advice, Hi Quality Turf has the experience and professional reputation you can trust for a perfect result for your commercial property. We pride ourselves on our superior service; for advice call us on 1800 887 258 or send us an email for a quick response.